ENJOY MESMERIZING WIDE WATER VIEWS WITH PRIVACY from your spacious balcony. This 2 bedroom 2 bathroom split floor plan also features a den, (which is a rare find within the communities of Isla Del Sol) which can serve as an office or an extra room to sleep additional guests. The owners have recently remodeled their kitchen removing walls creating a more open feel. The kitchen boasts custom cabinetry, granite countertops, and newer appliances. Both bathrooms have been renovated! The master suite also provides fantastic big Bay views! The convenient assigned parking space is only a few steps to the lobby/elevator. Isla Key is a beautifully landscaped well run community with abundant reserves. Contemporary in design and emanating a luxury resort feel. The pool & spa area is second to none. Other amenities include Bocce' ball & Tru hard tennis courts. Tremendous income potential with high demand for seasonal rentals (30 day minimum). Fish right from your seawall! 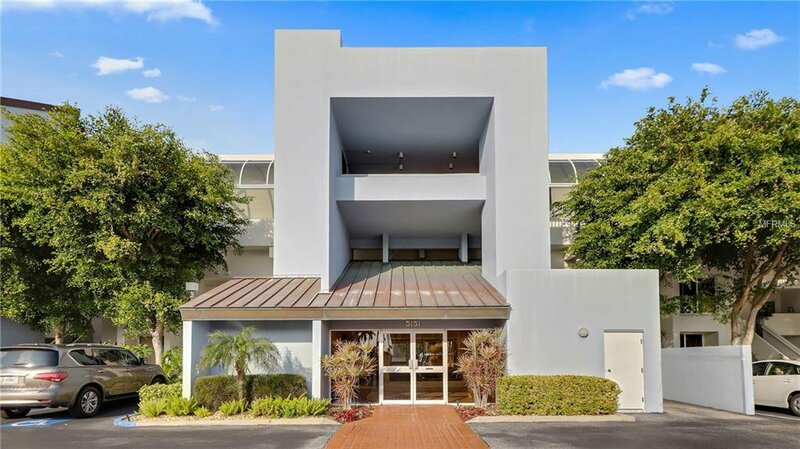 Located just 30 minutes from Tampa International Airport, 10 minutes to all the diverse venues of Downtown, 10 minutes to Famous Ft De Soto Park and closest to the fine sandy beaches of St Pete. Listing courtesy of RE/MAX METRO. Selling Office: RE/MAX METRO.